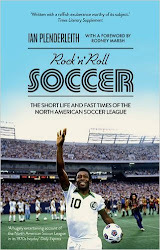 Here's the link to my interview late last night on World Soccer Talk Radio with Nate Abaurrea, which was thoroughly enjoyable thanks to his having closely read the book we were talking about - Rock n Roll Soccer (published today in the United States and Canada by St. Martin's Press/Thomas Dunne Books). That's not necessarily always the case, as I discovered when I was in the UK in 2001, attempting to promote my first book For Whom The Ball Rolls, a selection of adult-oriented, football-based short fiction (clearly not a category that anyone had a clue how to market, given its sales figures). I was booked in to appear on the Fi Glover Show on BBC Radio 5 Live, along with various other luminaries of broadsheet sporting journalism - Sue Mott of The Daily Telegraph and Jim White, at that time of The Guardian. We chatted in the booth beforehand. I was terrified. They were both very posh and confident. Jim told a funny story about something that had happened to him at a game at the weekend, and we all chuckled. They asked me about my book, pretended that they were really interested, and both promised to write something about it. Neither ever did, but hey, they're busy people, and a promise in the media world is worth as much as the sodden beer mat it's written on (a few years later my Dad bought me Jim White's book You'll Win Nothing With Kids, but eight years on I still haven't opened it. So there). To the studio. Fi Glover wasn't there, and some bloke whose name I can't remember was standing in. He briefed us - we'd start by talking about my book, and then move on to a general chat about the sporting events of the weekend. Fine. The countdown - then the host introduced all of us. I was still terrified. He turned to me and announced my book to the world. "I haven't read the book," he said glibly, then added something like, "but presumably these are stories very much rooted in actual experience." That was my cue. Was that an actual question? Was I supposed to agree with it? Say something like "Yes, they are" and see what he said next? 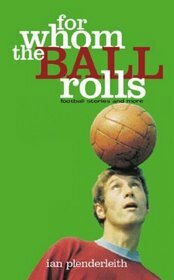 Of course, looking back, it was a chance for me to promote myself by banging on about my vast experience of the football world, and how that had inspired me to write football-based fiction. At that second, though, my mind was a complete blank. National BBC Radio 5 Live experienced a five-second silence. It felt like five minutes, and I can still see the host's increasingly desperate face, waiting for me not to screw up his show in the very first minute. And here I was, the nervous debutant appearing in front of a huge and expectant crowd, and I'd clumsily conceded a penalty just 30 seconds in. Eventually I stuttered out something about the stories being more of a product of my imagination. That wasn't the right answer at all, and no one followed it up. We moved rapidly on to the sporting events of the weekend. Jim White told the same anecdote he'd told in the booth beforehand, and everyone except me laughed, like they were hearing it for the first time. Play the game, Ian. Maybe that's why he never wrote anything about my book, because I didn't laugh twice at his story. Now I was no longer being introduced as Ian Plenderleith, author of fantastic new book For Whom The Ball Rolls, but as Ian Plenderleith of When Saturday Comes magazine. Fine, if that's the way you want it. My nerves subsided and I started to talk. A lot. My friend Tim Bradford, who was at home making a tape of the broadcast, said that my normally accent-neutral voice gradually started sounding more northern, as though defiantly countering the well-honed tones of my southern counterparts. By the end of the show I sounded like I was from darkest Leeds, wilfully and bolshily contradicting everything that Sue and Jim said (okay, so that's why they never wrote anything about my bloody book). I can't remember much what we were talking about, but I do remembering slagging off Rangers and Celtic and the Scottish FA, and making a joke about Princess Anne being an actual horse. The BBC never asked me back (though like Jim and Sue, they promised that they would). Tim gave me the tape, but I've never listened to it, and I don't even know where it is. Even if I wanted to hear me get into my stroppy stride taking on these titans of the established fourth estate, I could never face hearing again that five-second silence at the start of the show. And wishing that I had interrupted the sentence, "I haven't read the book..." with a full-on northern roar of, "Well then you're not doing your fookin' job very well, are you lad?" That's how you generate publicity.